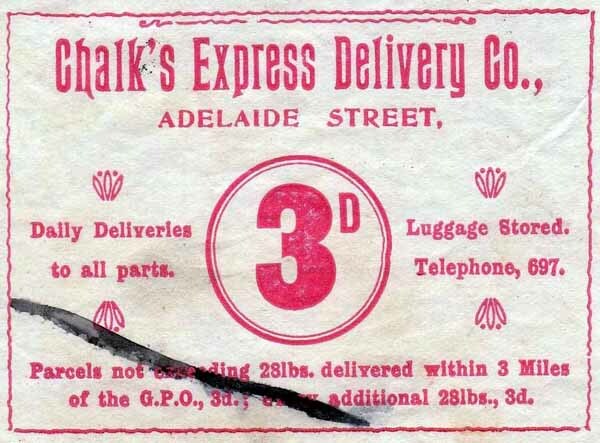 Very little is known about this exceedingly rare Chalks Express Delivery Co Brisbane Queensland, local parcel delivery private revenue. This is the only recorded copy, that’s right 1 copy only found. Maybe you have one in your collection? If so I would appreciate a scan or photocopy and then we can record it here. For the record it is on plain open wove paper imperf. Printer, probably Watson Ferguson and Co Queen Street Brisbane the same printers used by Thomas Bryce. Brisbane Local Carriers in the 1900’s.